I thought I’d continue my Friday posts on books I’m reading in addition to the official 100 we are reading through. After waiting six months to see if my 9-year-old would ever start reading Kingdom Keepers by Ridley Pearson, I decided to just read it myself! 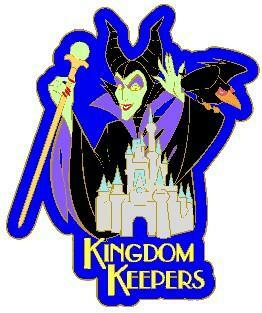 In the Kingdom Keepers, four children are designated as DHIs – Disney Host Interactives. This means that they were filmed, and a 4D hologram version of each of them wanders freely around the Magic Kingdom, interacting with guests and answering questions. The kids soon learn that Disney villains and other characters in the park come alive when the guests have left, which is an intriguing thought. The balance of good and evil is in jeopardy, because the villains want to gain control of the parks and possibly beyond. They are led by Maleficent, although the book alludes to the fact that she may be taking orders from another villain. The DHIs discover more by “crossing over” as holograms when they fall asleep, and they can all go over together if they fall asleep at the same time. There are some scary scenes for the younger set, (spoiler alert) especially when they go into The Small World and the animatronic Small World characters come to life and start to follow them, biting and fighting. Actually, I’m not sure how much of a spoiler alert that is, because the moment the book mentions that characters are coming to life, I envisioned a Small World scene, as I’m sure most others did. I really enjoyed the book, especially the deference that is paid to Walt Disney. A central notion in the book is the fact that Mr. Disney knew this villain uprising could happen and put clues and assistance in place to help the next generation. It’s very similar to National Treasure in that respect, where the central characters embark on a quest using clever clues, while they battle the villains who want to stop them from discovering too much within those clues. The one small issue I had is that sometimes this read like an extended advertisement for Disney, especially when it mentioned specific things, such as Mickey’s Not So Scary Halloween party being the best thing about the fall season. The kids also head out on their own a lot to spend the day at Disney or the water parks. It’s just not that easy to do! I’m interested to read further into the series, as I imagine that the gang will discover more villains and explore different parks. Keep Reading… and Keep Moving Forward! ‹ PreviousWhy did I read so much Shakespeare? thanks for the great trapped-in-Splash-Mountain-with-evil-animatronics-come-alive nightmare!